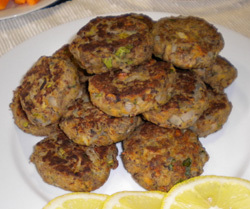 If you are looking for an easy fish cake recipe then look no further. This is one of those great quick dinner recipes for kids that moms and dads love too. Canned fish recipes are so great because of the obvious convenience factor that saves us so much time and effort - it's readily available at supermarkets and can be kept in your store-cupboard till you need it. The same can be said for canned beans. This fish cake recipe embraces their convenience and can be whipped up in no time at all. Your kids will love to help you make the mixture into salmon cakes. Studies have shown that when children are involved in preparing the food, they tend to eat better. While you are preparing the food together it’s a great idea to chat about what makes these fish cakes so healthy. This will help them to learn about healthy food and that it is delicious and fun. I normally use mackerel for this recipe but you can also used canned tuna or shrimp which is equally delicious. 1. Remove the bones from the canned salmon and flake the meat finely. Put the flaked fish into a mixing bowl. 3. Heat 2t (10ml) olive oil in a pan and gently fry the onions and celery until softened, then add to the above mixture. 4. Add the rest of the ingredients except the olive oil and mix until well combined. 5. Shape the mixture into about 16 salmon patties – you can make them as big or small as you like. 6. Heat the remaining olive oil in a pan then gently fry the patties until golden and cooked through, turning once. I like to steam fry them by putting a lid on the pan. This creates a bit of an oven effect and “bakes” the fish cakes without burning them on the outside. This is done over a moderately low heat. 7. I love to serve these salmon patties with a fresh salad and veggies. If you have a great tasting healthy recipe that you would like to share on this website, please click on this care to share? link to submit your recipe. I am always so happy to get new and exciting healthy recipes. Please note that all your details will remain completely confidential. I won’t give them away to anybody and will contact you personally in order to receive your permission to use your recipe on this website.